Every week, our SMS system are able to fulfill some of our members wishes, that is to strike top prize. Yes, we did it! Do you want to win top prize? If yes, you have the opportunity to receive the number by joining our Gold membership. We selected from our analysis a group of 15 to 21 sets of system numbers. With the computer program, it will pick one of the set to send to you. Yes, you need an extra luck to receive this winning number. Some of you may not be lucky enough to receive the same top prize number. Not to worry, we provide extra mile of services. We pick some of these SMS numbers and list them at the forecast section. You can log in to our webpage and pick some numbers there. 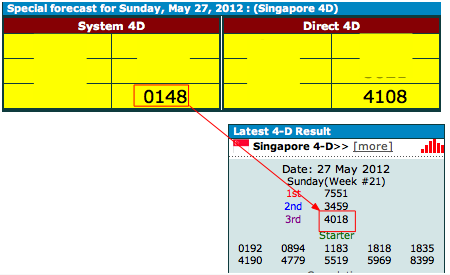 Below is the 3rd prize winning number on 27 May 2012 listed in the forecast area.